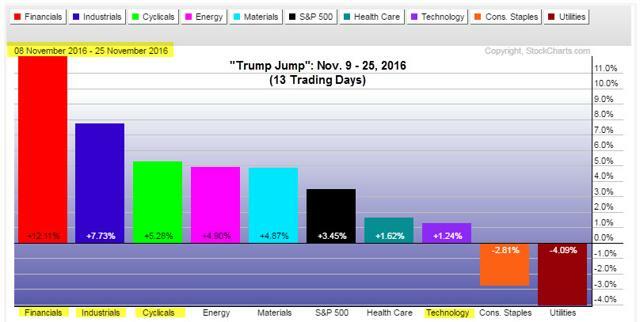 Sector Analysis: Trump Rally Telegraphed By The Transports – Week Ending Nov. 25, 2016. The "Trump Jump" rally continued this last week with Materials and Industrials leading the pack. In the Materials sector, industry-group leaders were from non-ferrous metals (i.e. copper), aluminum, and steel. Industrials were led by commercial vehicles, heavy construction and industrial suppliers. This is obviously in anticipation of president-elect Trump following through with his U.S. infrastructure revitalization plans. 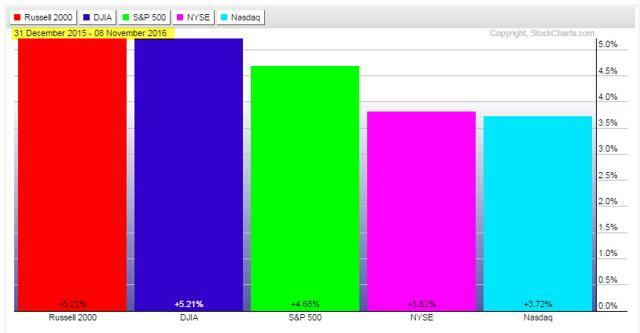 The small-cap Russell 2000, the NASDAQ, and the NYSE composite have all outperformed their corresponding Nov. 8 th YTD metrics during this 13-day rally. 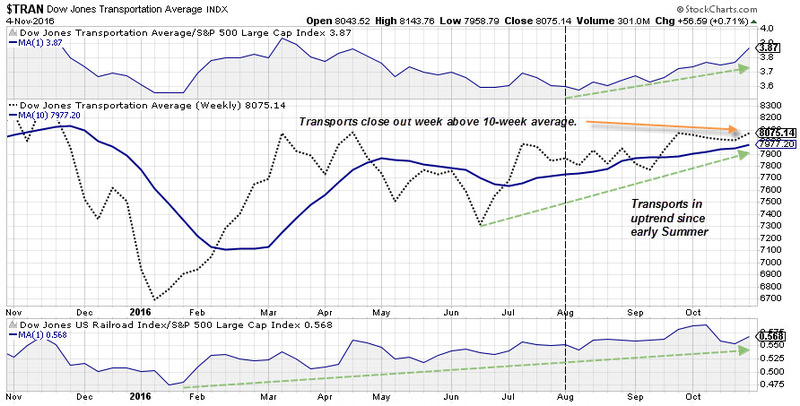 It's an impressive rally, but is it sustainable without at least a short-term pullback? 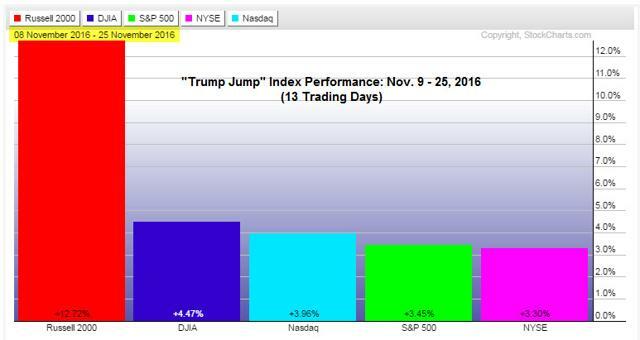 Was the Transportation Index Telegraphing a Trump Upset? 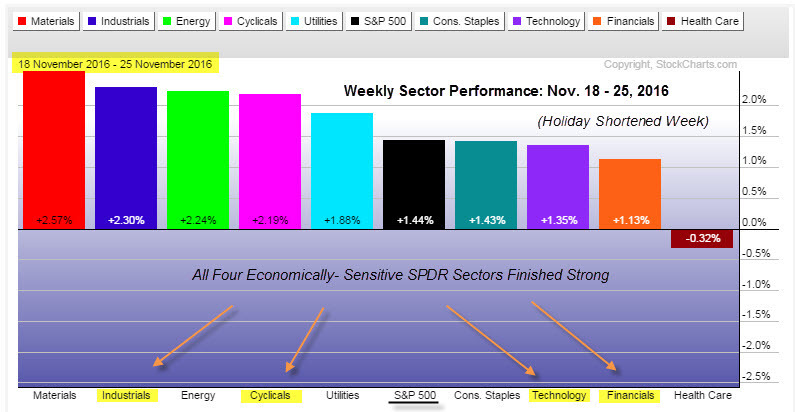 Sector Analysis: Dow Transports Telegraphing Strength - Week Ending Nov. 4, 2016. Sector Analysis: Seeking Alpha Using Relative Strength - Week Ending Oct. 14, 2016. How To Time The Market: Preview Of Seasonality Trends For Q4-2016. Disclosure: I am/we are long XLY,IYT.